Income Averaging- Creating More Housing Now! With the goal of working towards the creation of Industry Standards, Dominium is proud to share much of what we have learned about income averaging through discussions with industry experts in a series of topic-based correspondence that is meant to be shared with all interested industry professionals. We hope that through the sharing of this content, we can encourage the industry to work together to create widely accepted practices of how to utilize income averaging in a way that is both consistent and marketable. Hi everyone, this is Jen Brewerton. I am the Vice President of Compliance here at Dominium. I would like to start out by saying that I love thinking and talking about income averaging because it is an incredible tool that we can use to serve households at income levels that we have never been able to serve with the traditional 20/50 or 40/60 minimum set aside tests. As I see it, the tax credit heaven has opened up and sent down a new minimum set aside that will change our world for the better! Today, I'd like to talk to you about what I call, 'the cliff'. Since March, I have been to a series of conferences and industry/state agency meetings about income averaging, and I have heard so many people talking about what's being called, 'the cliff'. I am here to tell you, there is NO cliff, and we should all understand why and spread the message throughout our affordable housing world! It is important to understand the difference between a single unit going out of compliance versus a project failing the minimum set aside test. When a unit goes out of compliance, credits are only lost on that single unit. However, when a project fails to meet the minimum set aside, the project loses credits on all units. That concept did not change with the income averaging set aside provision. How Do We Know When the Minimum Set Aside Test is Satisfied for This New 'Income Averaging' Option? At the heart of the cliff discussion is the lack of clarity from the IRS in how to evidence that a project meets the minimum set aside under the average income test. Basically, we aren't sure how to designate units for the minimum set aside (many of us are working to get that clarity). While that may be unclear, it does not mean that one unit out of compliance equals a violation of minimum set aside. There is no cliff. For example, the following project has nine units of equal size with an average affordability of exactly 60%. 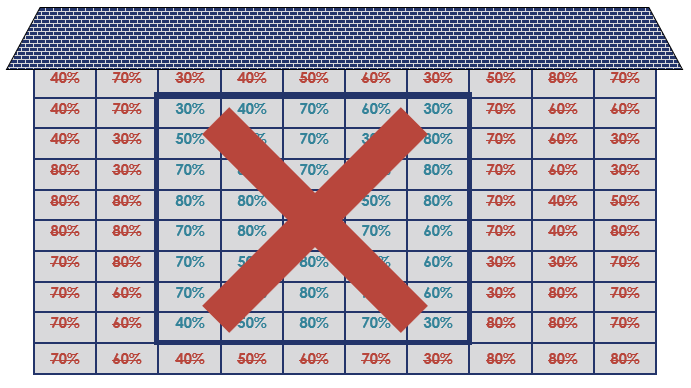 If one of the 20% units is found to be out of compliance, the project average would decrease to 65%. Does this project fail the minimum set aside test? No! There is no cliff! A project meets the average income minimum set aside test as long as at least 40% of its units have an average affordability of 60% or less. 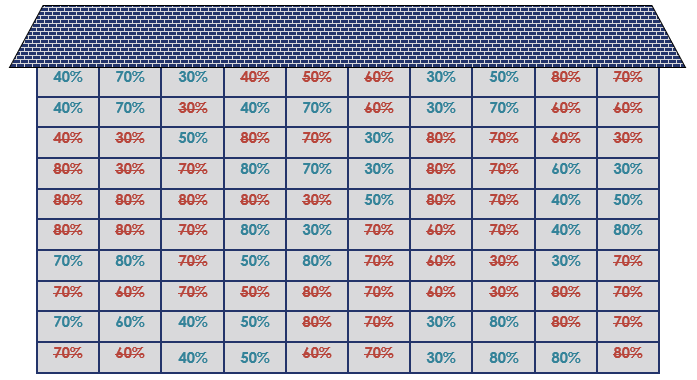 In this example, we can identify the 40% of the units (four units) that, when we average their income designations, the average affordability is 60%. The minimum set aside test represents the minimum number of units required to be low-income for the project to claim any credits. This is different from the applicable fraction, which determines how many credits can be claimed in the building in any given year. 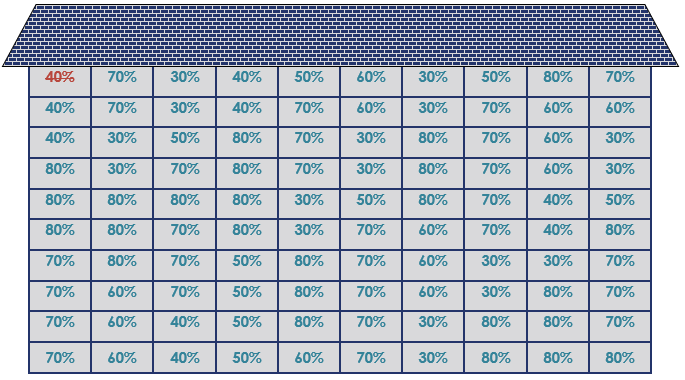 In this example, the applicable fraction is 100% since all the units are required to be low-income. While the project is eligible to claim credits because the minimum set aside is met, the amount of credit the building could generate is affected because the applicable fraction is less than 100%. In other words, there is a loss of credit, but credit can still be claimed! The following project has 10 units of equal size with an average affordability of exactly 60%. If one of the 40% units is found to be out of compliance, the project average would increase to 62.2%. 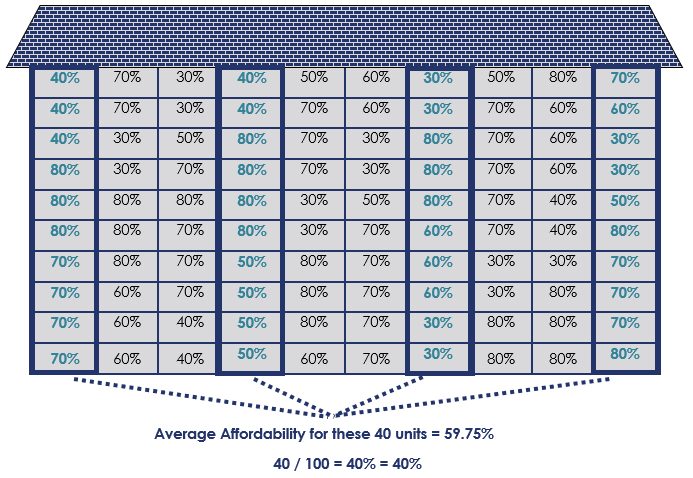 To answer the minimum set aside test we simply ask, do 40% or more of the units in the project have an average affordability that is 60% or less? The answer is clearly yes. There are eight units in the project that have an average affordability of 60% or less. Therefore, the minimum set aside is far exceeded. Now let's assume that there are three 40% units found to be out of compliance, resulting in the project average increasing to 68.6%. To answer the minimum set aside test, we simply ask 'do 40% or more of the units in the project have an average affordability that is 60% or less?' The answer is still yes. There are four units in the project that have an average affordability of 60% or less. Therefore, the minimum set aside is met. Let's examine this on a much larger scale by looking at a 100 unit project. On a 100 unit project, as long as at least 40 units have an average affordability of 60% or less, then the project would continue to meet the minimum set aside. This is regardless of anything that happens with the remaining 60 units. 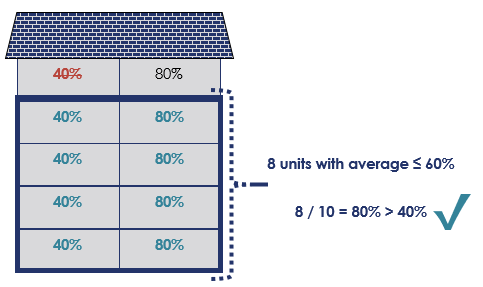 Any combination of units can be identified as intended to satisfy the minimum set aside, as long the average affordability of the units is ≤ 60%. But, if these were the only 40 units in compliance, they would NOT satisfy the test because the average affordability is 60.75%. Not just any combination of units will work! The units intended to evidence that the minimum set aside is met must have an affordability average ≤ 60%. Since the only 40 units in compliance have an average affordability period that exceeds 60%, the minimum set aside has not been met and no credit can be claimed for the project. This project has failed the minimum set aside test! 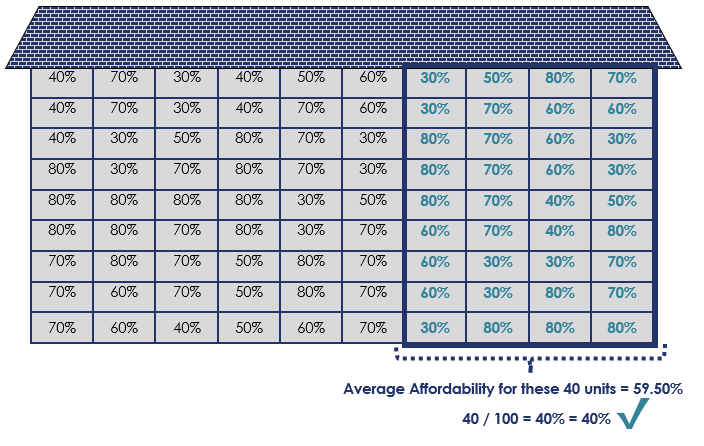 Conversely, this would NOT fail the test because, even though there is a 40% unit out of compliance, there is still a minimum of 40% of the units that do have an average affordability ≤ 60%. With the noncompliance in the 40% unit, the project average increases to 60.10%. While the building's applicable fraction of 100% was not achieved with the one unit out of compliance, this results in a loss of credit for that unit. Having the unit out of compliance is not a violation of the minimum set aside. There are still 99 units in the project that are in compliance! In fact, you could have up to 60 units out of compliance as long as the remaining 40 units have an average affordability of 60% or less. For example, you could have the following units all go out of compliance and still satisfy the minimum set aside test because the average affordability of the remaining 40 units is 52.50%. As can be seen in the examples above, an average income project will typically have a fairly large buffer before it be deemed to fail the minimum set aside. Unless a project is a mixed income project that is already at or close to the minimum set aside, one unit going out of compliance will never cause the project to fail the minimum set aside. Here at Dominium, we are always happy to talk to you about this. We love income averaging! If you'd like to speak with us please feel free to reach out at IncomeAveraging@dominiuminc.com In addition, you can visit us at the 2018 AHF Live Summit in Chicago this week (November 12 and 13th) and at the Novogradac 2018 Tax Credit Housing Finance Conference in Las Vegas at the end of the month. In closing, I hope we can all help spread the word that there is no cliff! If we don't, then we could lose this new and amazing option to serve low-income households.